Great location in the city center with the best view at the Central Market. The cozy apartment with high ceilings is over 200 years old. A parking space is available in a nearby garage for additional fee. All the main city attractions are within walking distance (Dragon Bridge, Old Town, Triple Bridge, Prešeren Square, Ljubljana Castle). There are great restaurants close by, and many cafes, bars and pubs just across the river. 2 Supermarkets nearby. Suitable for families, couples and small groups. The spacious apartment (70 m2) on the 1st floor is newly renovated and furnished. It consists of fully equipped kitchen with dishwasher, huge living room with sitting area and dining corner, master bedroom, smaller office which also acts as a secondary bedroom, bathroom with washing machine and a doorway (see photos for the apartment plan). The whole apartment; and a kitchenette in the stairway on the same floor, where you can freely use the coffee machine to make espresso coffee. A parking space can be arranged for you to use in a nearby public garage (300 meters away) for additional payment. Please inform me in advance whether you will need the parking. See "Other things to note" for more info on the parking. I will be available to assist you at the house most of the time; if not, contact me by phone or e-mail. In case of an urgent matter, my parents or I will mostly be available for assistance at home, one floor above the apartment. Tourist Tax is NOT included in the price (3.13 €/person/night; children 7-18 years 1.56 €/child/night) - paid at the property. You can buy a Ljubljana Card (online or at Tourist Information Centres), which is a combined ticket to Ljubljana's major sights enabling visitors to explore the city in a comfortable way and at the lowest cost. Unlimited bus rides, free guided tours, boat tour, admissions to museums or ZOO, funicular ride, Ljubljana Castle & more for a period of 1, 2 or 3 days. More info at VisitLjubljana website. An artist by heart, I am working in video post-production and graphic designing. I like to learn different languages and meet new people. I am a hard-worker, always ready to help. This apartment can't be in a better location. With the mixture of the old-house feel and modern accessories it is a cozy place. The apartment is newly renovated (november 2016). If needed, you can ask us to lend the mobile phone. Air condition in master bedroom and living room. Please use only when needed. Central heating during colder seasons. Bed sheets, pillows, covers, mattress covers... Complete bedding linen provided. Available, not directly in the apartment. Ask us if you need it. Parking is available for an add. fee in a nearby public garage, 250m away. Additional price for the parking space is 25€/night; 40€/2 nights, 50€/3 nights ... Discount for longer stays, unlimited entries and exits. Paid at check-in. Free high speed internet, WiFi throughout the whole space. Internet cable available on the desk in the office/ second bedroom. 2 towels per person. Can ask for another change of towels if your stay is longer than 2 nights. 3-seat sofa (can fit 3-4) + 2 taburets + 4 additional chairs available. Dishwasher with dishwasher soap/tablets available. Ceramic hob with 4 cooking spots. "First breakfast": Bread, butter, marmelade, milk, juice, ham, eggs, coffee, teas, sugar. Welcome drink: beer or/and wine. All dishes, pots, pans, cups, cutlery, whisk, etc. Whatever you need in the kitchen is available to you. Great location next to the market and the funicular and trail to the Castle! Very nice apartment with a lot of details and amenities added. Sarka was a very friendly and responsive host. We very much enjoyed our stay and will come back again. Wonderful accommodation! Working with Sarka in planning our stay, and while we were there, made us feel right at home, and helped us to get the most out of our visit. The apartment has everything you need, and a variety of choices for sleeping. Having the market right there is lots of fun, and it is right there by old town. So easy to walk everywhere!! We highly recommend that you stay here!! We, my wife and I, have 04 excellent nights in Ljubljana. 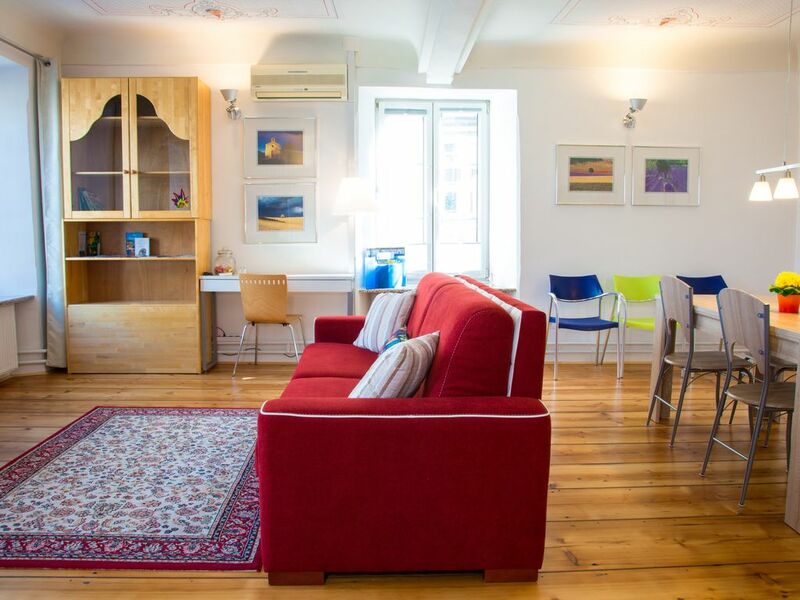 The apartament is very good and have everything you need to spend confortable days in Ljubljana. The photos on the site faithfully depict the apartment. The location is fantastic, opposite the city market and very close to the city center. The castle is just behind the apartment. The hostess is extremely friendly and, prior to check in, gave us various directions and information needed upon our arrival in Ljubljana. In addition, she leaves numerous instructions and tips about the city. As a courtesy there is still an espresso machine in the hall of the building. And even more important, it's a good company to drink a beer. Definitely a local get-away if we return to Ljubljana. We loved our stay in this apartment in Ljubljana. Sarka was so kind to arrange her private driver when we came and when we left; she provided us with fresh apples, milk, juice, eggs, bread, meat and cheese, and sweets when we arrived - what a surprise!! She is a wealth of information about her city, too. I loved waking up before the sun came up to watch the vendors set up the produce market right outside our window - it was magical with the holiday lights as well. We fell in love with Ljubljana! My partner and I stayed here for 3 nights in June. It was fantastic. The location is unbeatable and the apartment is spacious with everything we needed. It was the best way to enjoy a long weekend in Ljubljana. Sarka was really helpful with information, and helped us to park the car in a nearby garage. There are supermarkets in the same building as the garage - a short walk. The fruit and vegetable market is across the road and is really good. We were there on a Friday so the open kitchen was operating in the central market - a great way to taste a lot of different food and wine. Ljubljana is a great city and staying here made it really special. We would love to return! Great apt, well represented in photos, excellent location, well appointed with everything you need for a comfortable stay. Sarka is a gracious host and responds quickly to questions and helps with special needs. Lots of space to spread out, which was nice because my sister was traveling with me and we have different sleep hours. Instructions for everything, plus tips on location of grocery, bakery, etc all outlined in the apt with great clarity. One of the best rentals I've had, and I travel extensively and rent almost monthly. The apartment is located at the edge of a pedestrian zone of the Old Town Ljubljana - you can easily drive your car to the entrance, though you need to park elsewhere. We help with the parking space in a nearby public garage for additional fee. All the main city attractions are within 20 minutes walk. Across the street is the Central Market where you can buy fresh fruit and vegetables. In the warmer months "Open Kitchen" is open every nice-weather-Friday behind the Cathedral, where you can try different foods and drinks at the stalls. Tourist Information Center is located beside the Central Market, where you can also rent a bike in the warmer months. Go to the medieval Ljubljana Castle using the same street where the apartment is (max. 10 minute walk) or go there by the funicular around the corner. Enjoy the heartbeat of Ljubljana by sitting in one of the cafes, drinking coffee and watching the hustle and bustle of the town. Don't forget to try some of the Slovenian traditional food! Great restaurants are within 10 minute walk. Tourist tax is mandatory and is to be paid at the property. Parking space will be available on request and for additional fee in a nearby public garage.